If you have any questions about your hand-eye coordination, dexterity, reaction speed, and overall skills with a knife, get a mango. 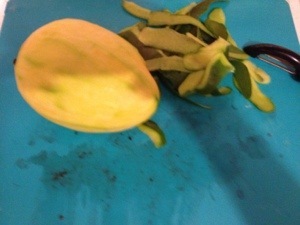 Turning a mango into mango makes you learn a lot about yourself. If you’re wondering why my cutting board looks weird, know I also cut up strawberries tonight, and the colours definitely don’t complement each other. 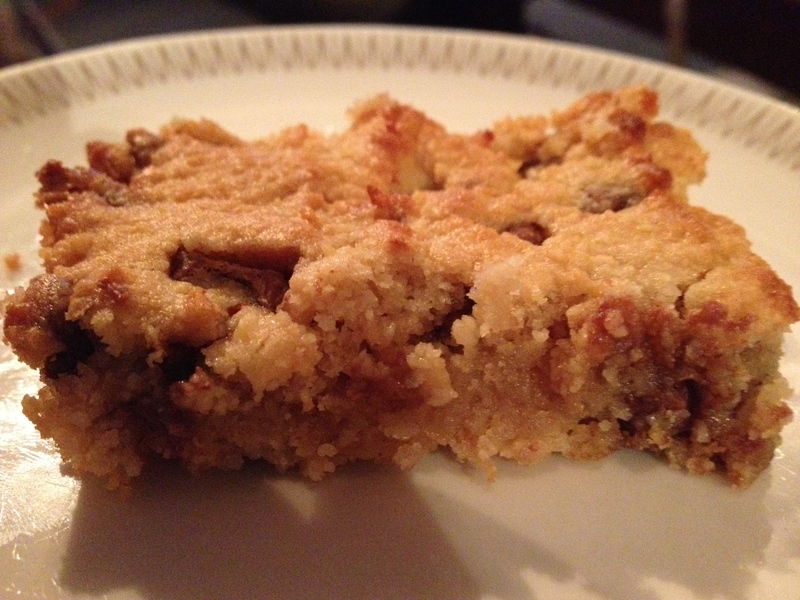 As it is crazy marking season in my Real Life, I’m opting for quicker meals and easy treats. This recipe is one of my new favourites; it is sweet and satisfying, but you don’t feel like you’ve eaten a big, stodgy dessert when you’re done. If you want to make it more of a treat and not quite as good for you, leave out the oats and flax, reduce the agave nectar to just under 1/3 cup, and only include 1 tablespoon of milk. 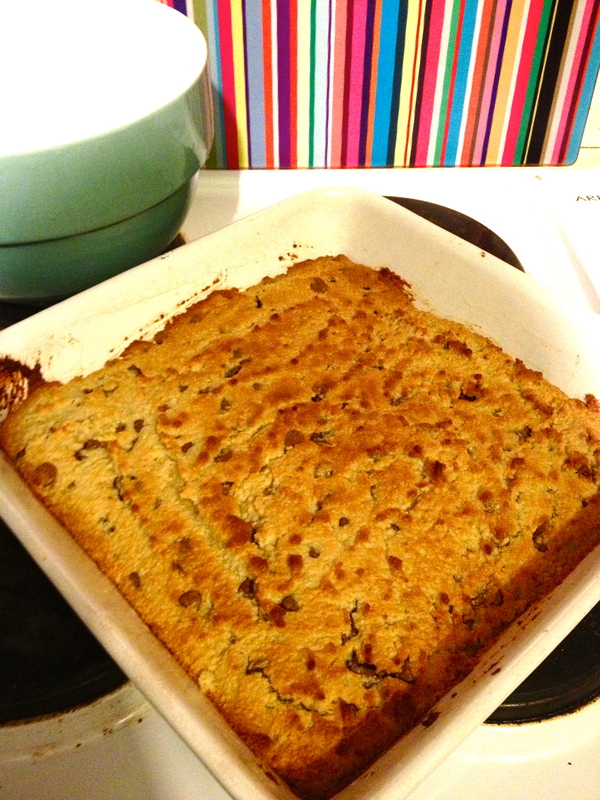 I like a bit more texture, and I like the addition of the oats and flax for mixed fibre. Without it, they are softer and smooshier, almost like a blondie. Both are tasty, and both come recommended by my husband, the undisputed King of Desserts Sydney Makes. Preheat oven to 350°F/175°C. Lightly grease the bottom and sides of your baking pan. In the large mixing bowl, combine your almond flour, flax meal, oats, baking soda, and salt. Whisk well. Almond flour won’t clump as badly as other flours, but, because it has a slightly wetter texture, it can stick to the bottom and sides of your bowl and keep it from being properly mixed. In the small bowl, combine the agave nectar, coconut oil, vanilla extract, milk, and eggs. Whisk to combine. Add the wet ingredients into the dry and whisk together. Let stand for five minutes. Whisk again. Fold your chocolate chips into the batter with the spatula. Scoop (yes, it will be scooping instead of pouring) your batter into the baking pan and smooth. Try to get the top as smooth as you can to ensure even cooking. Bake for 15-20 minutes, depending on your oven. You want a golden colour on the top. Remove and let stand for at least 30 minutes before cutting. If you’re impatient (like we were), they taste just fine scooped out with a spoon after 15 minutes, but they won’t hold their shape. They actually taste the best the next day once they get a bit more smooshy! Seriously, you have to wait. I know it’s not fair. I first met Megon more than twenty years ago (eep!). Her sister, Heather, was my very first best friend, and, thanks to the magic of the internet, our families have reconnected. A wee while ago, we met up with some other ladies at Heather’s house for a seed swap. I brought that peanut butter pie I made, and the only other thing I could eat was Megon’s chicken salad. Once I tasted it, I didn’t mind so much! One month ago today, Megon made the commitment to her body to do what she knew she had to do and stop eating gluten. She may have gone kicking and screaming, but she never looked back. In the past month, she has had medical and personal developments to show her that gluten-free was the way to be. Leaving gluten behind is not easy. Through watching her, I realized that, even though I am 100% aware that it’s what’s right for my body, I don’t know if I could go through it all over again. It is brutal. In honour of her strength — and the strength of all you gents and ladies who have gone through the same thing — I’m sharing her chicken salad recipe. Even better is that the recipe is super-easy. Eat it up. Pulse the apricots in the food processor. Dump all the other ingredients except the chicken into the food processor to combine. When fully integrated, empty into the mixing bowl and stir in the chicken. It’s great served with crackers or tortilla chips . . . or on bread . . . or on a spoon. 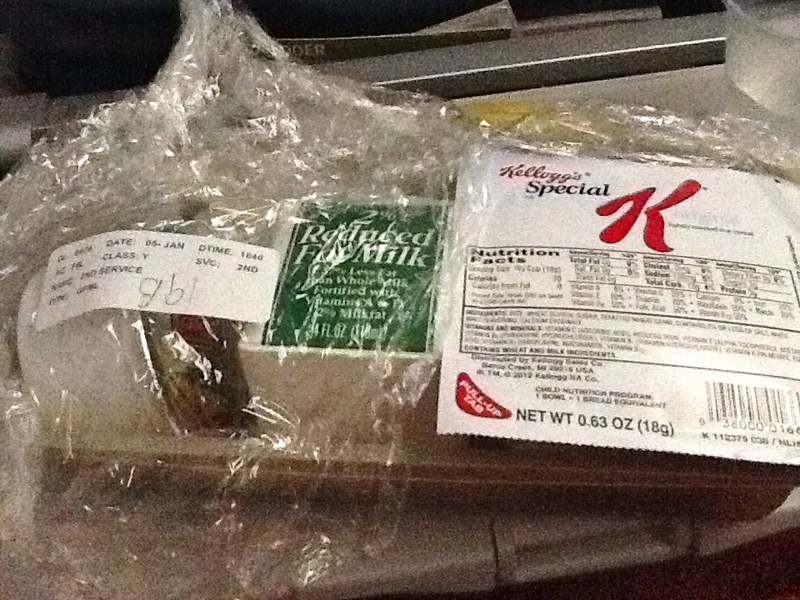 This picture is the breakfast that I was given on January 6, 2013 on a transatlantic Delta flight. 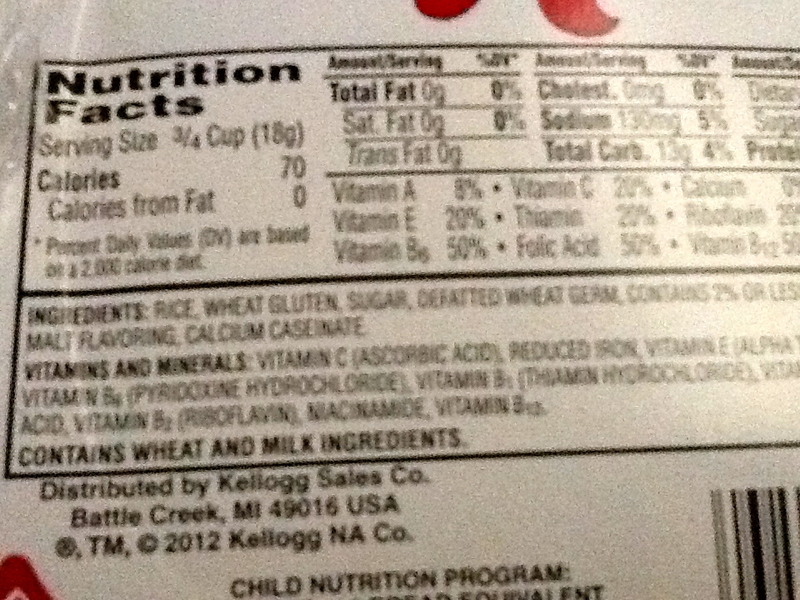 If you’re not familiar with Special K cereal (which I was not), here is a close-up of the label. I know it’s blurry, but I think you can read it well enough. The second ingredient is “wheat gluten”. There is also an allergen warning which reads “CONTAINS WHEAT AND MILK INGREDIENTS”. I can understand the confusion — it says “Lightly Toasted Rice Cereal” — but, as a major company, you have to pay closer attention when a passenger asks for a special meal. Just because the first ingredient is rice does not mean that it doesn’t have wheat. Since I couldn’t get a great picture before I devoured it, I’ll tell you what it is. 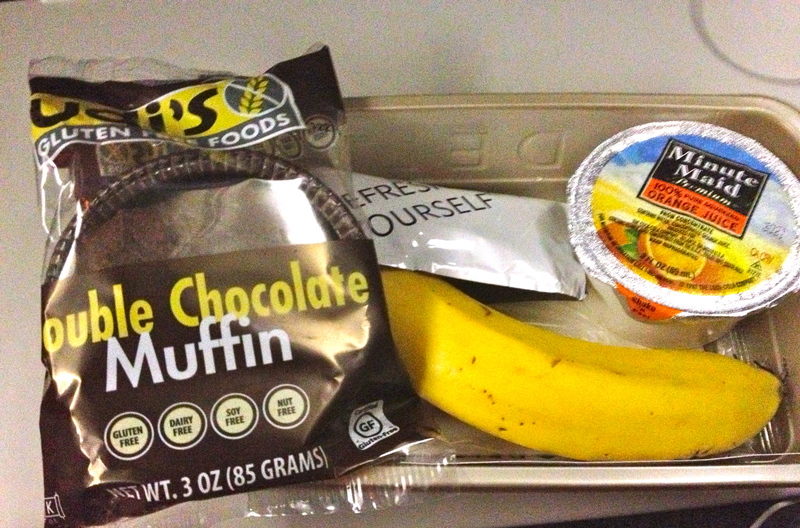 It’s an Udi’s Gluten Free Foods Double Chocolate Muffin, and it was delicious. I can even forgive them for insisting that everyone wants orange juice with breakfast for giving me something so yummy. What an improvement, Delta! Because I’m just as vocal when I’m impressed as when I’m disappointed, I’ve let both Delta and Udi’s know how pleased I am. Edit: Is it a coincidence that I just received my first-ever Delta flight survey? I am back home to Belfast! I wish I could say it feels great, but so far it feels like my head against my pillow — but MY pillow! The tiny traveller made it, too; she got lots of special attention from a lovely family on the transatlantic flight, so she arrived feeling very important and very cute. 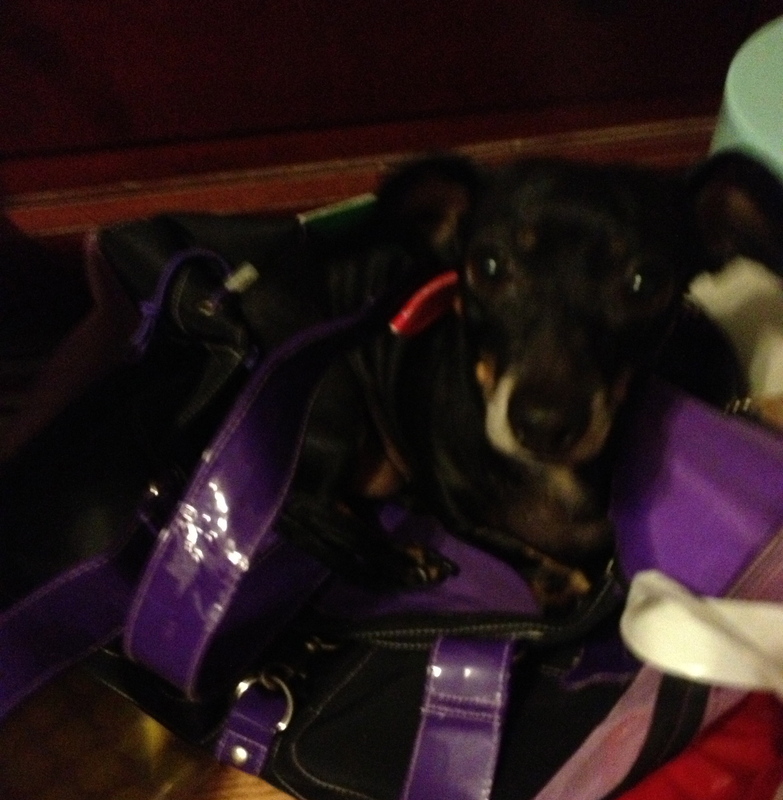 She climbed into her luggage while I was packing and did not want to get out. 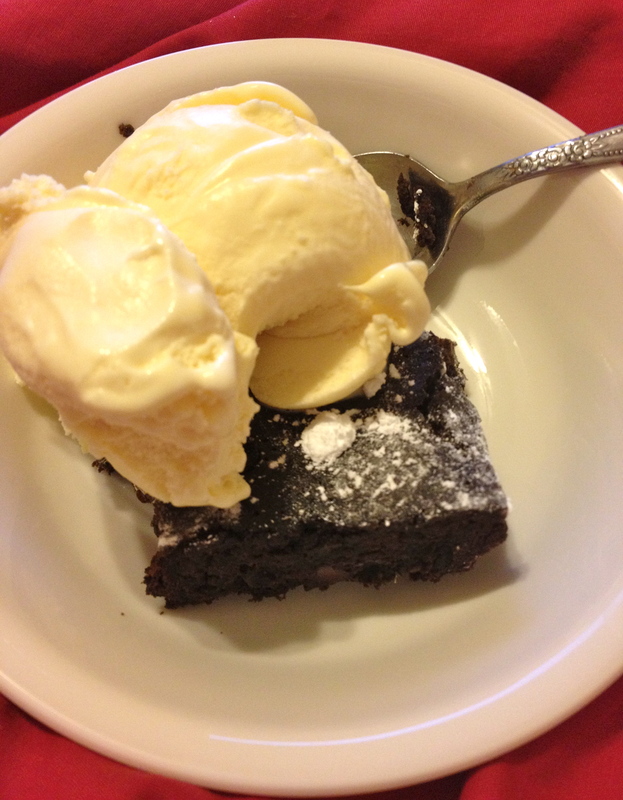 A couple of days before I left, I made dinner with dessert for the family. I’ll be posting the dinner later, but the dessert was too good to leave for long. 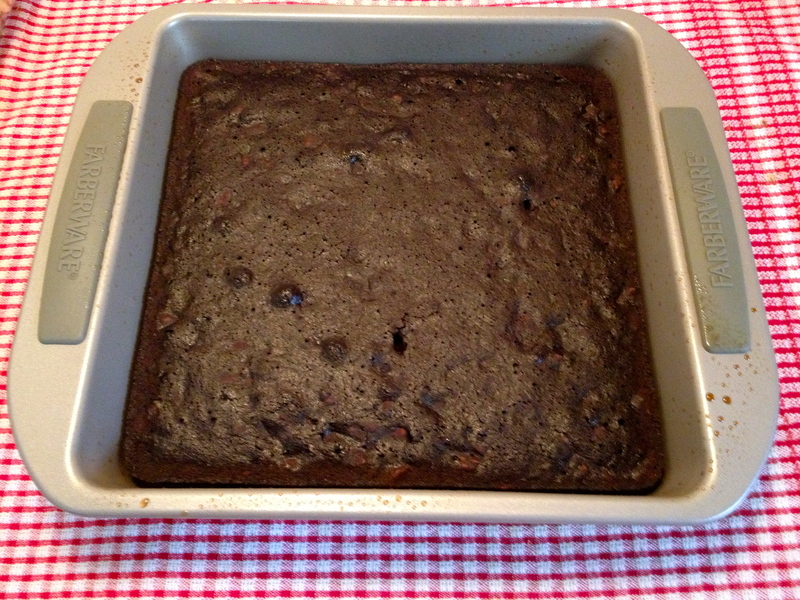 The beans provide the starch necessary to hold the brownie batter together without the need for any sort of flour, but they also provide a high level of fibre and protein among other great things. Even my incredibly picky grandfather enjoyed these guys. If you’re not a big fan of dark chocolate, use regular cocoa powder. My mother didn’t care for it until she had a scoop of ice cream with it because of the richness. 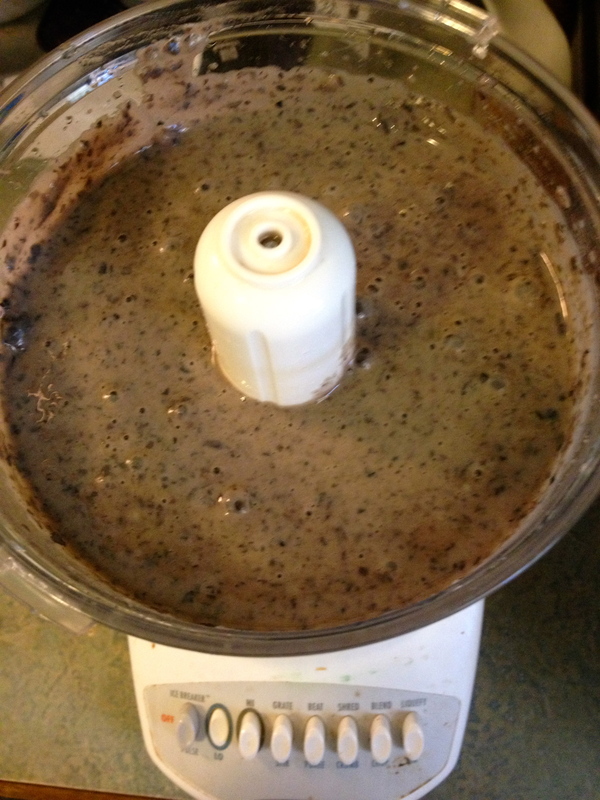 Drain and rinse the black beans in the sieve/colander. You want the water to run cleanly through the beans. Shake off the excess water. Blitz the beans and eggs together in the food processor. It will look soupy, but the eggs helps the beans to break down better. Without them, the beans will be very lumpy. Add the vanilla, salt, and cocoa powder. Pulse to combine. Transfer to a mixing bowl. Stir in the sugar with the spatula. When completely combined, it should look like any other brownie batter. I added some chopped pecans and chocolate chips (no measurements, just whatever looked right), but I think they would be great without them. 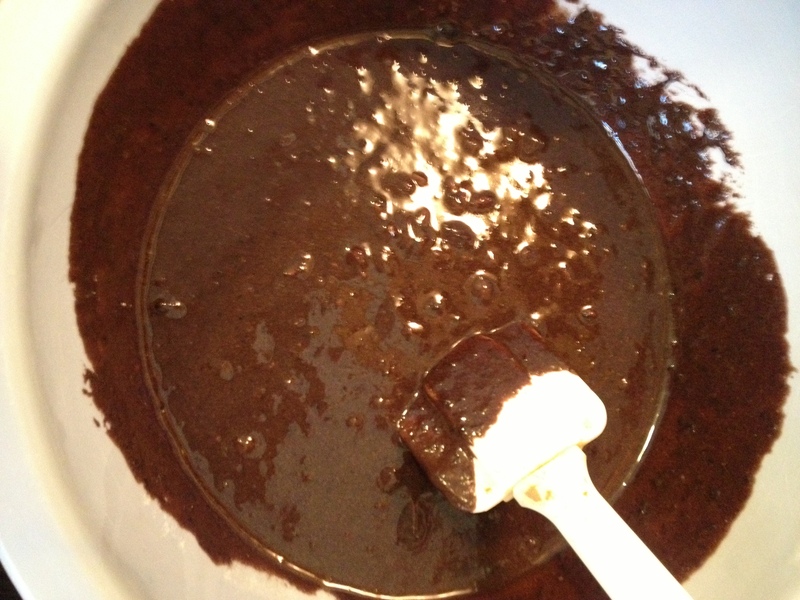 Brownie batter — can you even tell this stuff started as a weird soup? 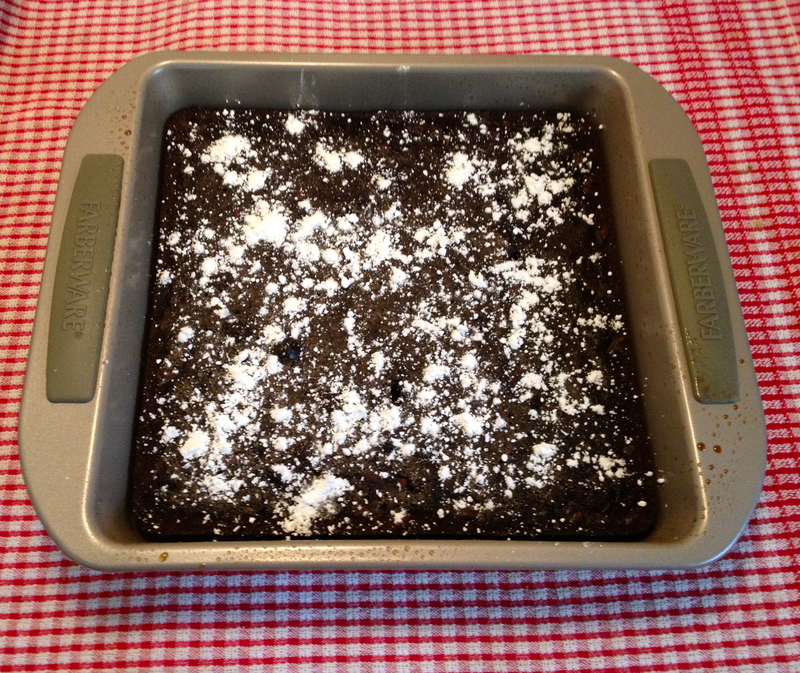 Pour into the greased baking pan and bake for 28 minutes or until a toothpick comes out cleanly. Sprinkle the icing sugar over the top if you’re feeling fancy. I was. Wait until they are completely cooled before slicing. I cut mine into 16 pieces. If you make them bigger, no one will judge you. Just tell them you’re eating your vegetables.